Photo by Brandon Macz: While WSDOT has a legislative directive to find a way to potentially save the Montlake Market, staff say it's unlikely the small grocery store can survive the Montlake Phase for SR 520 reconstruction. Nearly 200 community members filled St. Demetrios Greek Orthodox Church Wednesday night, Nov. 7, to hear a status update on the Washington State Department of Transportation’s acquisition of the property occupied by Montlake Boulevard Market, as well as to sound off about their concerns with the acquisition. WSDOT is in the process of acquiring the property in the 2600 block of 22nd Avenue East, as well as the neighboring 76 gas station property, for the Montlake Phase of the State Route 520 reconstruction project. The department contends it needs those properties to build the necessary improvements, which is part of WSDOT’s I-5 to Lake Washington “Rest of the West” program. WSDOT engineering manager Ron Paananen said the state expects to complete the acquisition process “in the next few months,” though the fate of the building that houses the market remains in the balance. “I want you to understand that no final determination has been made around the market,” WSDOT ombudsman and community liaison David Goldberg told audience members at the outset of the meeting. The Montlake Phase is a $455 million design-build project, construction director Dave Becher said. WSDOT expects to begin the Montlake phase of construction early next year, with construction running through 2023. The project has been awarded to Graham Construction, Paananen said. Graham had the lowest bid, which was still $30 million higher than what was budgeted. 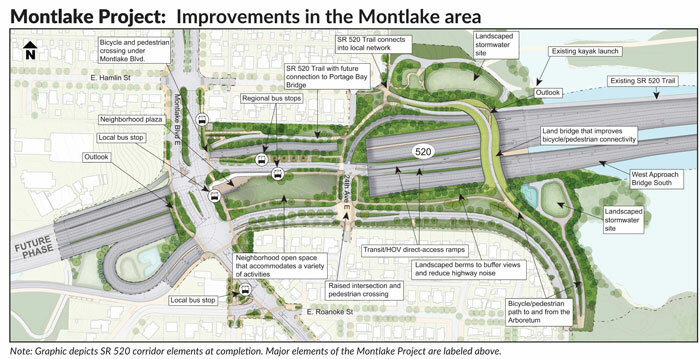 The Montlake Phase includes the construction of a lid over SR 520, a pedestrian and bicycle land bridge, and a new West Approach Bridge South for eastbound traffic that will connect to the floating bridge over Lake Washington. Lid construction will entail raising Montlake Boulevard by 4 1/2 feet, to avoid a King County sewer line that runs under SR 520 and still meet roadway clearance requirements. Paananen said one of the goals for the project is not having to replace that pipe, which was built under SR 520 when it was constructed in 1962. Should the pipe need to be replaced, it would have to be done through the market property. Although early design plans aimed to avoid the market property — a 2011 environmental impact statement recognized the community support for the market — WSDOT determined in 2016 it could not move forward with the Montlake Phase without acquiring the property. The popular neighborhood market, affectionately known to locals as the “Hop-In,” is a longtime community staple and favorite. In March, the state Legislature issued a proviso calling for the transportation department to find ways to could preserve the market building during construction. 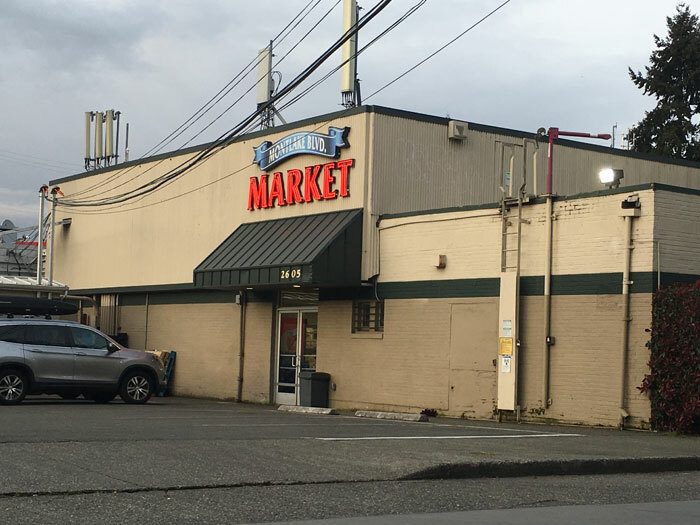 “The department [WSDOT] shall work with its design-build contractor to ensure to the maximum extent practicable that the building housing any grocery store or market currently located on parcel number 1-23190 will be preserved,” the legislative proviso states. WSDOT has also encountered legal challenges from those in the community. A coalition that includes the Montlake Market owners is challenging the state in court. Wednesday’s meeting was packed with many longtime residents who have lived in the Montlake neighborhood for more than 20 and 30 years, some for more than 50. “If it’s not clear to everybody by now that [the market] just can’t go away, then I don’t know what else we need to say,” one neighborhood resident said. Some audience members were critical of the level of transparency WSDOT provided up until Wednesday’s meeting, and pushed for more community dialogue. “We need to make sure that all the bidders bid the same way, and then we can address concerns that the state or the city has in regards to the market,” he said. WSDOT will begin its practical design process for the market building, holding a series of workshops with the city and the contractor that will run into next month. In December, the department will hold another public meeting to provide another project update and solicit more feedback from the community. A final evaluation and determination is expected from WSDOT by the end of this year.